With the expansion of the BECKHOFF Fieldbus Box family through the EtherCAT Box, EtherCAT I/O technology no longer needs an electrical cabinet. Modules from this IP 67-rated series feature an integrated direct interface to EtherCAT, so that the system’s high performance is retained down to each I/O module. This opens up possibilities in the ‘machine mount’ IP 67 world such as fast process data communication with extreme Fast Control technology (XFC), high-precision measurement technology and integrated drive functions directly in the field. With dimensions of 126 x 30 x 26.5mm (H x W x D), the modules are small and are suitable for applications where space is limited. The new EtherCAT Box, available from BECKHOFF Automation , combines the benefits of the Fieldbus Box modules with the high performance of the EtherCAT communication system. 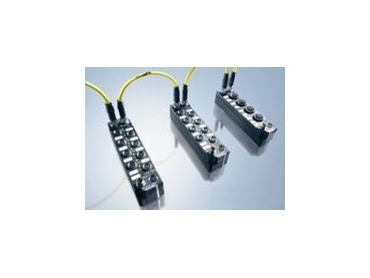 This makes the EtherCAT Box suitable for applications located in harsh industrial environments. The EtherCAT connection is established through screened M8 screw connectors. Communication through standard Ethernet cables permits networking of the EtherCAT Box modules over distances of up to 100m. The BECKHOFF EtherCAT Box provides the high-performance capabilities of EtherCAT on external points throughout a machine line and offers the basis for using BECKHOFF XFC technology. Through fast I/O response times, XFC enables increased machine and system throughput, since signal delay times are reduced. The EtherCAT Box modules cover the traditional range of requirements for IP 67 I/O signals such as digital inputs with different filters (3.0 ms or 10 µs), digital outputs with 0.5 or 2 A output current, analogue inputs and outputs with 16 bit resolution, thermocouple and RTD inputs, and stepper motor modules. Modules with time stamp inputs are available for XFC. Sensors and actuators are connected through screw-type M8 or M12 connectors as required.